Joshua has his father’s eyes. Not in the figurative “Oh, you look so much like your father” sense that well-meaning relatives and family friends might utter while ruffling your hair at Thanksgiving, Christmas, or other extended get-togethers. Not in an ancestry sense either, where similar curves, hues, and any future need for reading glasses has been passed like a genetic baton from generation to generation. But in a very literal sense. When the bandages come off at Christchurch Hospital and shapes and light start filtering into Joshua’s consciousness after years of darkness, it is because of a gift from the man Joshua calls his father. Light streams into the teenager’s world because Detective Inspector Mitchell Logan donated his eyes to his blind child. Detective Logan doesn’t need them anymore. He was killed in the line of duty, trying to corral a sadistic killer at a building site. Shot with a nail gun and tossed from the fourth floor. It’s the second time Joshua has had a father die being a hero. The new light in his life is tainted by loss. As he tries to adjust, while grieving, everything is changed, so fresh, so vivid. Even when he closes his eyes; stark images come. Violent acts of crime and crime fighting. Has Joshua received more than just his father’s eyes? Paul Cleave’s tenth thriller, A Killer Harvest, takes the multi-award-winning New Zealand author into a slightly new realm, with its teenage protagonist and touch of the supernatural. It’s also a nod to his horror-writing roots as an unpublished author, before he broke through in 2006 with The Cleaner, a powerful serial killer tale that topped bestseller charts in Europe and sold a quarter of a million copies in Germany alone within its first few months. “I pretty much only read horror when I was young, and for some time there I’d only read Stephen King,” says Cleave, looking back on his days growing up in Christchurch, a coastal city roughly the size of Minneapolis, backdropped by scenery from The Lord of the Rings. There is a delicious malevolence to Cleave’s thrillers, tempered by dark humour and prose that crackles with energy and verve. He’s the kind of author that aficionados and fellow authors rave about, even if he isn’t yet a household name to casual mystery fans. During our interview, Cleave reminisces about getting scolded by his high school teacher for writing stories about Santa having a drug addiction. “My teacher held me back after school to ask how I knew about shooting heroin. I said my Mum showed me how.” When I ask him how writing from a teenager’s perspective changed the way he envisaged, researched and wrote A Killer Harvest, he starts with “I’d wait outside schools and watch teenagers”. The truth is less creepy. That ‘whole eye transplant thing’, and the associated idea of cellular memory – where transplanted organs carry memories from the donors – gives A Killer Harvest a touch of the supernatural, but it’s still firmly grounded in the mystery world. If Cleave was a literary author from Latin America, we’d call the book magical realism: an exciting tale with a primarily realistic view of our world, incorporating a single magical or fantastical element. As his career has progressed, Cleave hasn’t been afraid to experiment and stretch his storytelling wings. His previous novel was the exceptional psychological thriller, Trust No One, centred on a crime writer suffering from early onset Alzheimer’s who starts confessing that he’s a killer and the crimes in his books are real. His carers don’t believe him, but people have been disappearing. Told from multiple perspectives from the same character (including a rare chunk of second-person narrative), Trust No One garnered high acclaim from critics across the globe, was feted as a ‘literary hall of mirrors’ with the ‘ultimate unreliable narrator’, and won Cleave a record third Ngaio Marsh Award in his home country. The book was no longer a young adult novel; instead an adult thriller with a teenage hero. One of the tricky things with this book was how to incorporate that idea of cellular memory, of organ recipients feeling like they might have someone else’s memories or emotions. For Cleave, while the idea of the eye transplant and cellular memory were the original acorns for A Killer Harvest, and a fascinating hook, they’re not what his tenth book is about. Vicious killers pepper the ten books that Cleave has published, but they’re not what elevate his writing above most serial killer thrillers out there. Along with his darkly hypnotic prose and powerful characterization, it’s that sense of underlying, universal themes that give added depth to his tense page-turners. In Blood Men, which won Cleave his first Ngaio Marsh Award back in 2011, a young man has to turn to his father, an imprisoned killer, for help when his world falls apart. How thin is the line between good people and bad acts? Cleave’s eighth novel, the award-winning Five Minutes Alone (the fourth in his series starring troubled Christchurch investigator Theo Tate), features a criminal offering victims and families the oft-asked ‘five minutes alone’ with perpetrators. Where does justice lie? Nowadays, Cleave knows that fears of being unable to write another book are well-shared in the writing community. And that even if he struggles for months, a fresh idea that will have him excitedly tearing through another first draft can be just around the corner. Craig Sisterson is a lawyer turned writer from New Zealand, now living in London. 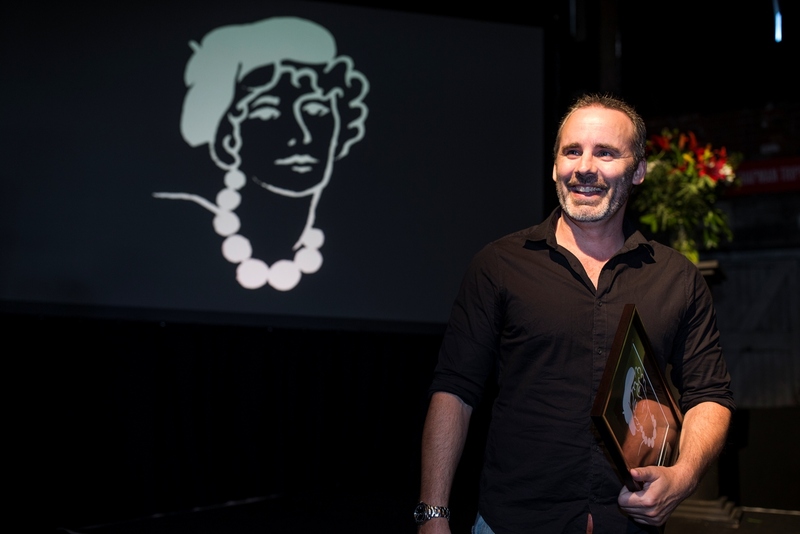 He’s interviewed more than 180 crime writers, including onstage at festivals in Europe and Australasia, is a judge of the McIlvanney Prize, and founder of the Ngaio Marsh Awards. This feature was first published in the Fall 2017 issue of Mystery Scene magazine, and is published here online for the first time as part of the 2018 Ngaio Marsh Awards blog tour. A KILLER HARVEST is a finalist for Best Novel.